Labor Day Weekend is here, and we're headed into another fall. Kids are headed back to school, and thousands of military service members and their families are settling into new homes on new bases. They have different jobs and different skills, but for many of them, the next fight they face will be the same. Every year, more than 200,000 service men and women transition from the military to the civilian workforce, and most are inevitably challenged by that jump. So as we head into another fall, I'm thinking a lot about these men and women. Around this time last year, I worked with my teams at Toyota and Hiring Our Heroes to host my first transition workshop at a Service Member Transition Summit at Joint Base Lewis-McChord, Washington. Inspired by my own challenges after separating from the military, our team refined and expanded that workshop into the Hiring Our Heroes Education Tour -- a nationwide effort to share my transition experience as a post-9/11 veteran with as many servicemen and women as possible and to help them prepare for a smooth entry into the civilian workforce. It's incredible to think about how many service members have come through the program in just a year. 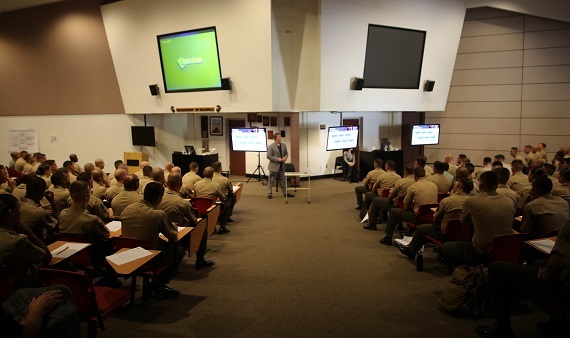 Through the Education Tour, more than a thousand service members from every branch and background have been equipped with the resources and information they need to take those next steps. Thousands more have signed up for Resume Engine, a site which I co-developed to reach those who needed tactical help translating their military skills into a strong personal brand for civilian employers. Still, I meet men and women every day who have reached the tail end of their military service and find themselves asking these questions: What are my options? Where do I start? When do I start? This tells me that our work -- and the work of every base transition office -- remains not only relevant, but critical. I believe we have an opportunity to scale these efforts -- to build on this momentum, go bigger, and reach even more service members and military spouses. Along with Toyota and Hiring Our Heroes, I've enlisted some fellow veterans and military spouses to help, and we have a big announcement coming soon. In the meantime, we are gearing up for four more Education Tour stops this October. Over a period of two weeks, I'll be supporting transition services for Marines stationed at Twentynine Palms, California; Camp Lejeune, North Carolina; New River, North Carolina; and Cherry Point, NC. We're rolling out a refreshed curriculum made stronger by the feedback we've received from past attendees. We're sharing it with service members 12 to 18 months from separating because we recognize that transition is not a point in time, but a process. The earlier you begin that process, the better. And we're working on some innovative ways to multiply our impact. We want to make sure that every person who wears our country's uniform knows that the value of their service and sacrifice extends well beyond the military. When I joined the Marine Corps at 17, I wasn't just signing up for four years. I was committing to a lifetime of service - a mission that continues for me and for millions of other veterans ready to work.